Last week, I was looking forward to having Venerable Tarpa arrive at Dharma Friendship Foundation for a weekend retreat. I was also a bit nervous because I have yet to master the art of sitting still when I experience sensations in my knee or hips. 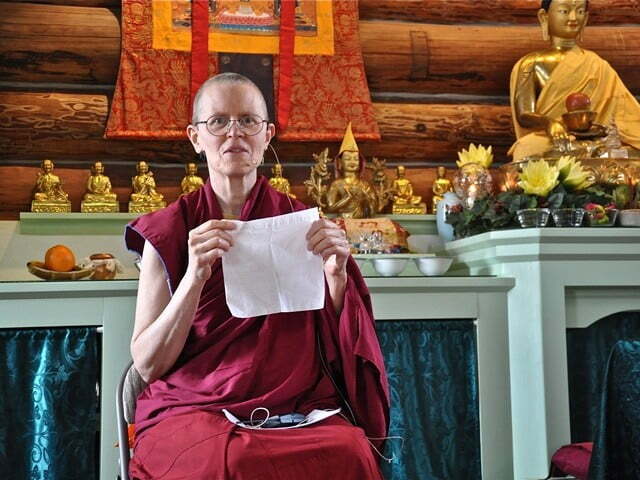 Venerable Tarpa is a resident monastic at Sravasti Abbey in Newport, WA. I aspire to move to the Abbey by the end of this year and until that happens, I visit as often as possible. Each time I visit, my practice develops more and is strengthened by the inspiration I receive from the resident community of practitioners and from the clear teachings given at every turn by Venerable Chodron. I also enjoy meeting new Dharma friends with common aspirations. Having Venerable Tarpa visit Seattle felt like taking a trip to Sravasti Abbey. My first introduction to Sravasti Abbey was 2007’s Memorial Day Weekend retreat. This was also my first introduction to Buddhist retreat in general. I chose it specifically because it was at Sravasti Abbey amongst a monastic community and because I deeply valued the teachings I had received from Venerable Chodron during her previous visits to Dharma Friendship Foundation. I also chose it because I felt a shorter, weekend retreat would allow me to explore the advantages of doing retreat and prepare me for doing longer retreats in the future. Since then, I have participated in two additional short retreats, several visits for many different occasions including offering service weekends, and Exploring Monastic Life-a two and a half week retreat. In the past few weeks, my practice has been very up and down and I was hoping the weekend retreat would help stabilize it. I received more than expected. The retreat began on Friday evening with a short introduction to the practice. At that time, it felt like several of us may have been unsure of how the weekend would go. I had never had a retreat opportunity in my own backyard and I imagine maybe some of the others had not had this experience either. When Venerable Tarpa entered with smiles and laughter, we were all put at ease. I had read the Meditation on the Buddha sadhana before and did not think that much of it. We say the recitations in it before all our teachings/practices at DFF and when I had read the text of the longer practice, it felt too long for me. But being guided through the practice by Venerable Tarpa in a retreat situation changed that for me. As a result, I have made this sadhana a part of my morning and evening practice. On Saturday, the day began with a teaching on the Five Powers as explained in the thought training texts. We had discussed them the prior week as part of our Tuesday night Lam Rim class, but they did not sink in as much as they did when I received Venerable Tarpa’s teachings on the subject. Over the weekend I came to value her honesty about her own practice/mind, her strong grasp of the topic, her personal narrative, and the fact that she had taken the time to read many different texts to prepare for the teachings. I have since made the Five Powers a part of my practice as well. She led us through the Meditation on the Buddha each morning after teachings and walking meditation. Then we ate lunch together after offering our food, and this was followed by another walking meditation. The discussion groups that came next revolved around four questions that provided us an opportunity to help each other with our practice. We all shared with open hearts about our challenges along the path and our strengths. We ended each day silently guiding ourselves through the Meditation on the Buddha. Each time we did the sadhana, we also did a Lamrim analytical meditation led by Venerable Tarpa. The entire day was a part of the practice, and as a result, I felt a stronger connection to the Buddha, the Path, the Sangha, and all sentient beings. The deepening of my practice renewed me. Because this was not a residential retreat, Venerable Tarpa asked us to maintain the retreat environment through the weekend by keeping silence when we returned home each evening. My family experience the impact of my benefiting from this weekend when I returned home each evening. My sister and mother, with a bit of humor, respected my silence, and my nieces (aged 3 and 6) made drawings for me. My 6 year old niece now wants me to take her with me to teachings, and she likes prostrating to the Buddha. Living in a house with three adults and two children can sometimes be loud and/or hectic. We have known each other our entire lives and that can also get difficult. But this past weekend, I noticed that the rest of my family spoke in hush tones with one another (a serious departure from the norm) and used more loving words. The house was peaceful and felt like an extension of the retreat. The wonderful thing about it was that we smiled at each other a lot more. There were many benefits from the past weekend. I renewed my connection with the Three Jewels and with my precepts. I strengthened my morning practice and restarted my evening practice. I am more thoughtful about offering food. I begin my days with a motivation to be of benefit. I live each day with this motivation and I carry the Buddha in my heart throughout the day. Recalling the benefits of this weekend brings me to tears as I write this, and I would like to encourage others to participate in a weekend retreat in the near future. Living in a city with a fast paced life, with perhaps few opportunities for encouragement along the path, makes retreat even more important and beneficial.